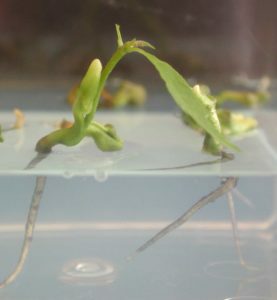 Tissue culture plants and those created from somatic embryogenesis are very vulnerable when going from laboratory conditions to greenhouse conditions. Choosing the right type of growing media is critical to a successful transplant. Photos of American chestnut seedlings in FlexiPlugs by John Bond. 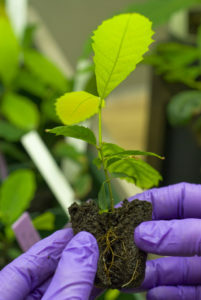 Research done by Lake Maner and Scott Merkle of the Warnell School of Forestery and Natural Resources for American Chestnut BioTech shows how much of the success of the in-vitro plant development is determined by the growing medium. 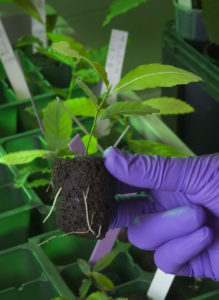 For tissue culture, some growers use loose filled trays or paper pots. Making a dibble hole large enough for a tissue culture plant with roots causes compression of the soil. This slows down development of the fragile root system right from the start. While the proper medium can address the challenges of transplanting on a micro level, control of the macro environment — the one between plants and in the larger greenhouse — is also critical. The right humidity and temperature in the greenhouse is essential. This means that the plug should be able to deal with a high RV and still provide the right air to water ratio. 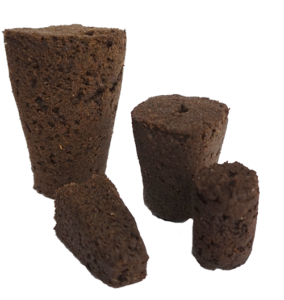 The Horseshoe Plug is one of the best solutions for growers that are looking to minimize root damage and improve overall plant health. Named after its horseshoe-like design, the plug features an open top and is immediately ready for growing. 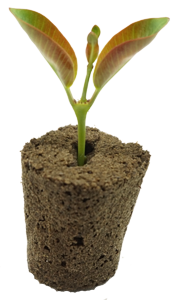 The Horseshoe makes it easy to put a tissue culture plant in without having to worry about root damage. The plug creates the perfect environment for plant growth. If you would like more information about the Horseshoe Plug, our new product line, please call us at 1-207-353-5005 to speak with one of our sales reps.
A polymerized peat plug such as Quick Plug North America’s FlexiPlug® and ZenPlugTM provide a stable environment that will not compress so roots always have access to air and moisture. 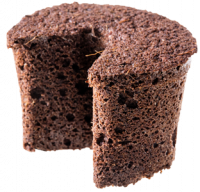 The ZenPlug goes one step further by allowing transplanters to rapidly and safely place the tissue cultured plant into the plug. 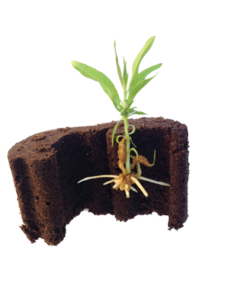 The benefits of a good rooting media can be seen not just in the early stages of plant growth but in its later development as well. The CatEyePlug for easy transplanting of tissue culture starts and pre-rooted cuttings. The “eye” of the plug allows for the precise and rapid placement of small and delicate plant material, such as tissue culture, micro cuttings and other hard to start plants. Contact us if you are interested in conducting a trial with our media. We are certain you will like the results.